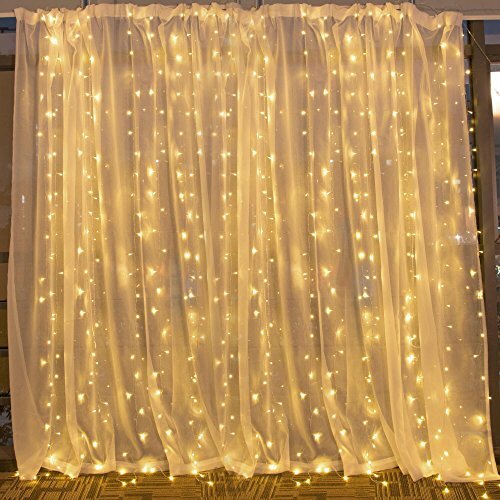 Wedding, Christmas, Holiday, Home Bedroom Wall Decoration, Party (9.8ft x 9.8ft, Warm white), Low voltage, transformer included. Bright LEDs: 9.8x9.8ft, 300 warm white LED bulbs, 9.8feet main strand, 19 drop strings. 120V AC Input, 29V output. Safe & Waterproof: UL listed power adaptor for indoor and outdoor use. IP44 Waterproof light wire in transparent color. Save to touch. Widely Use: Perfect icicle window curtain lights for wedding, party, home, kitchen, window, wall, bathroom, bedroom, festival, Holiday, Christmas warm up, doors, floors etc.